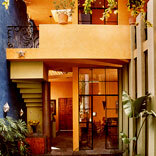 Casa Montana is definitely for people who absolutely want to escape all vestiges of modern life. This deserted mining town, 45 miles east of San Miguel de Allende offers the discriminating traveler a chance to go back in time to another era. Mineral de Pozos (Pozos) is located in the heart of Central Mexico, on the High Desert surrounded by the Sierra Gorda Mountains, with endless vistas in all directions. Whether your passion is art, archeology, photography, hiking, biking, dining, reading or relaxing, Casa Montana will fill your days and your senses with a full palate of choices. Daytime is filled with any number of interesting forays into the surrounding countryside. With an altitude of 7,500 feet, vistas run to the hundreds of miles in every direction. 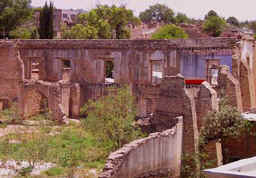 Exploring ancient ruins, old haciendas and churches and underground mine tunnels are popular pastimes in Pozos. Visits to resident artists and sculptors provide an interesting glimpse into the creative talent that resides in this area. 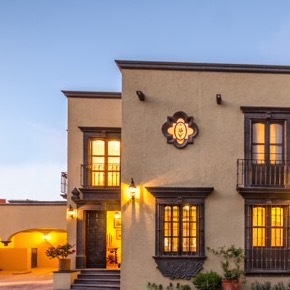 Pozos is an ideal place to stay and use as a base to visit such wonderful locations as San Miguel de Allende, Dolores Hidalgo, and Querétaro. 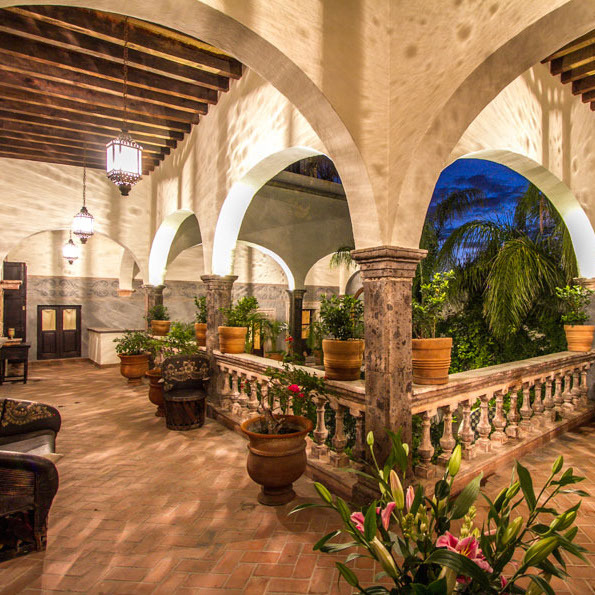 To spend a vacation at Casa Montana is to completely escape the stress and tensions of today's world-a step back in time when things were simpler. The dawning day is heralded by the music of thousands of singing birds and the ringing of church bells. These sounds are your cue to snuggle up for another hour of sleep before the aroma of fresh brewed coffee and frying bacon make it impossible to avoid the start of another incredible day in Mexico. 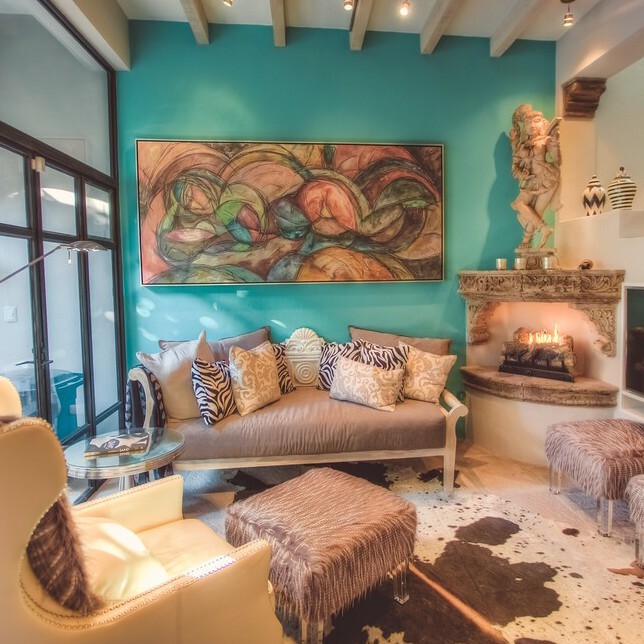 Casa Montana is a modern day miracle built to reflect the past opulence of the City of Mineral de Pozos. This ancient colonial city, dating back to the 1500's, was declared a Historical National Monument by the Mexican Government in 1982. Upon arriving in Pozos and entering the main town square, one is taken by the feeling that time has stood still in this perfect little town. The town square remains as it might have been hundreds of years ago, but then the unexpected happens. The doors to Casa Montana open to reveal the most stunning and sophisticated home one could imagine. The incredible rock walls evoke images of thousands of hours of handcrafted labor. A line item for 6% Mexican taxes will be added to all rental rates. Please note that a 20% holiday surcharge is added to all rental rates during Christmas, New Year's and Semana Santa (week before Easter). 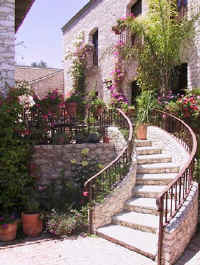 There are 5 bedrooms available in Casa Montana. Two in the main house are queen bedded suites with sitting area and spectacular baths with emerald green tiled giant tubs with shower and lots of natural light. Upon entering your suite, you know that you could stay forever in these warm and elegant surroundings. Beautiful wood French doors or windows open to balconies that frame breathtaking views. 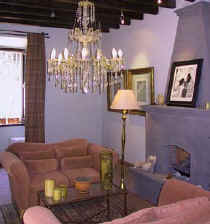 The high-beamed ceilings, a fireplace, a cozy sitting area with a comfortable couch for napping combine to make this a truly unique accommodation. The antique beds are incredibly comfortable and original art abounds. 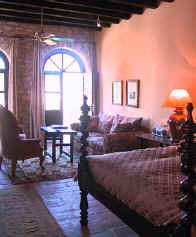 The more casual bedroom located in the casita has a queen bed with sitting area, fireplace and private bath. Two bedrooms are smaller: one with queen bed and private bath and the fifth with twin beds and private bath. All with fireplaces. Breakfast is included in your stay at Casa Montana, served by members of the bilingual staff. The most popular restaurant in Pozos is also located within the home and you can enjoy meals there when you prefer to eat in. 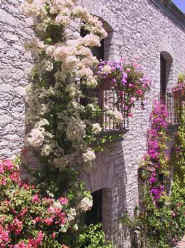 You may also want to eat at the other restaurants in Pozos or take a trip to the nearby colonial jewel towns nearby.